The Book of Mormon is an historical account of all of the visions, revelations, commandments, and covenants given by God to the people living in the Americas from approximately 600 B.C. to 400 A.D. It begins with the story of Lehi and his family, who left Jerusalem after Lehi saw a vision of Jerusalem’s destruction, and was commanded by the Lord to take his family and flee into the wilderness. After a journey of several years, Lehi’s family is ultimately led to the American continent, where they build a new civilization which lasts for nearly 1,000 years. Reading from the Book of Mormon every day has done more good for me and my friends and family than any other thing I could ever imagine. The blessings, the comfort, and the knowledge that I have gained of my Heavenly Father and His plan of salvation are worth more to me than any earthly reward I could ever receive or desire. 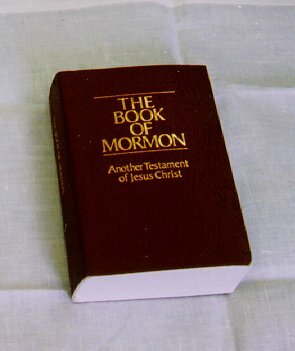 Just a few years ago, I decided to read the Book of Mormon all the way through for the first time ever. It took me about two or three months of daily reading, sometimes spending several hours a day, and other times, as little as ten or fifteen minutes. Reading the entire book from start to finish was an incredible experience. Although I was, at the time, inactive in the Church of Jesus Christ of Latter Day Saints, I knew that my life was severely lacking, and that nothing I had ever done could give me the peace of mind that faithful members of the Church always claim to possess. I was desperate for answers, and willing to do anything. Along with these records, they also possess the brass plates, which contain a record of the Jews and the writings of their prophets (among other things). In Chapter 19, Nephi mentions three prophets from the brass plates who do not appear in the Bible: Zenock, Neum, and Zenos. According to Nephi, these three prophets wrote about the life of Christ, and knew that the people would judge Christ “to be a thing of naught.” Nephi records some of their writings, and adds his own testimony that the Lord will redeem His people. In 1 Nephi 16, Lehi‘s colony resume their journey in the wilderness. They are guided in their journey by a “round ball of curious workmanship,” which “pointed the way whither we should go.” (1 Nephi 16:10) This ball, which we learn in Alma is called the Liahona, was essentially a compass that pointed the way Lehi and his family should go “according to the faith and diligence and heed” that they gave it. In 1 Nephi Chapter 8, Lehi shares his vision of the tree of life with his family. In it, he describes a large and spacious field “as if it had been a world,” and in it, a tree “whose fruit was desirable to make one happy.” He also describes a river of water which ran along near the tree, and a rod of iron and a straight and narrow path which led to the tree itself. He tells his family of four “multitudes,” each of which makes a separate journey through the large and spacious field. The first multitude start down the straight and narrow path toward the tree of life, but are soon overcome by a mist of darkness which causes them to lose their way, and to wander off and become lost. The second multitude catch hold of the rod of iron, and press through the mist to reach the tree. However, once there, this group is mocked by people in a great and spacious building, and they become ashamed of their actions and also fall away. The third multitude follow the rod of iron to the tree of life, partake of the fruit, and are not ashamed. In 1 Nephi 11-14, Nephi sees many of the same visions his father saw, including the vision of the tree of life. An angel of the Lord explains to him what each image in this vision represents, and then in Chapter 15, Nephi explains many of these things to his brothers, who cannot understand the vision at all. Nephi does not actually make any reference to the meaning of the fruit in his vision, but in 1 Nephi 15:36, he tells his brothers the fruit is “most precious and most desirable above all other fruits; yea, and it is the greatest of all the gifts of God.” Also, the Book of Mormon for Latter-day Saint Families explains in the footnotes for 1 Nephi 11:22 that “the Atonement of Jesus Christ is the greatest example of God’s love for His children.” From this I believe it can be inferred that the fruit is a symbol of the Atonement. In Chapter 12, Nephi sees many generations of Nephites and Lamanites gathered together to battle, and he sees a mist of darkness on the face of the promised land. (1 Nephi 12:1-4.) He then sees Christ’s visit to the Americas, after which three generations of Nephites pass away in righteousness. When the Nephites and the Lamanites again gather together to battle, Nephi learns that the river of filthy water represents the depths of hell, and the mist of darkness is the temptations of the devil. (1 Nephi 12:16-17, 15:26-29.) In 1 Nephi 12:18, Nephi learns again that the great and spacious building is “the pride of the children of men.” He also learns that a great and terrible gulf separates the wicked from the righteous, and that gulf is God’s justice. Nephi’s vision continues, but at this point his father’s vision of the tree of life has been explained, and the remainder of his vision deals with the future of the Gentiles and the eventual restoration of the gospel. It is not until the second half of Chapter 15 that Nephi returns to the vision of the tree of life, this time to explain the meaning to his brothers, who cannot understand it. By plugging in these definitions, it seems to me that Lehi’s vision is a representation of our world, and the tree of life is God’s love for us, through which we can receive the blessings of the Atonement, and can enjoy eternal life in God’s kingdom. The way to eternal life is by following the straight and narrow path (the gospel) and holding fast to the iron rod (the word of God.) Those who do so are able to enter in to God’s kingdom. But many will be lost to temptation, and will be drowned in the depths of hell. Many others will succumb to the pride of the world, and will put worldly matters above their own salvation. God’s justice will require that those whose actions are evil in this life be separated from those who follow the word of God. When seen in this light, I believe the vision of the tree of life becomes one of the most important messages in the Book of Mormon. It becomes a message of God’s love for all His children, and the promise of eternal life to all those who hold fast to the iron rod and follow the straight and narrow path. It also becomes a warning and a word of caution to avoid temptation, and not to allow pride to pull us off the path, but to shun the ways of the world and strive to remember the ways of the Lord in all that we do. 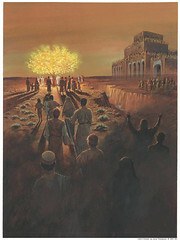 In Chapter 11, the Spirit of the Lord appears to Nephi and shows him the tree from Lehi’s vision. He asks Nephi if he sees the tree, and Nephi says yes, and then he asks Nephi what it is that he wants to know. Nephi tells him he wants to know the interpretation of Lehi’s dream, and the Spirit of the Lord departs and an angel takes his place. The angel shows Nephi several things that will come to pass, including the coming of Christ; his visit to the Americas; the complete annihilation of the Nephites; the formation of a great and abominable church among the Gentiles, which church will remove many plain and precious things from the scriptures; Christopher Columbus and the early European settlers; the American Revolution; and the restoration of the Gospel. (1 Nephi 11-14.) Throughout this vision, the angel uses these revelations to illustrate the meaning of Lehi’s vision. In verse 18, Nephi is reminded that the large and spacious building is the pride of the children of men, and he learns that a great and terrible gulf divides the righteous from the wicked. This gulf is God’s justice. Nephi sees that his seed will ultimately be destroyed by the Lamanites, because of their pride and the temptations of the devil. At the beginning of Chapter 13, Nephi is shown the formation of a great and abominable church among the Gentiles, which is most abominable above all other churches, and which “slayeth the saints of God, yea, and tortureth them and bindeth them down, and yoketh them with a yoke of iron, and bringeth them down into captivity. (1 Nephi 13:5.) Nephi learns that the founder of this church is the devil, and its aims are to destroy the true church of Christ. Next, he is shown Columbus and the early European settlers being guided to America by the Spirit of the Lord. He sees that the settlers scatter the seed of his brethren, and gain possession of the promised land. He sees that they carry the Bible with them; however, he also sees that the church of the devil has perverted the Bible down through the ages, taking away many plain and precious things, and causing many to stumble for lack of the true word of God. The angel tells Nephi that in the latter days, God will be merciful unto the Gentiles, and will restore his gospel to them. He tells him that the record kept by Nephi and his descendants (the Book of Mormon) will come forth unto the Gentiles, and will fill in the parts of the Bible that have been removed by the church of the devil, and the Bible and the Book of Mormon together will reveal God’s gospel to all men. Nephi learns in Chapter 14 that there are in essence only two churches among the children of men – the church of the Lamb of God, and the church of the devil. (1 Nephi 14:10.) The ultimate destiny of mankind will be to either follow the Lamb of God, and enjoy eternal life in God’s kingdom, or to follow the devil, and to be consigned to eternal damnation and suffering in hell. In the second half of Chapter 14, Nephi sees John the Beloved recording the Book of Revelations. He tells us that it has been given to John to prophesy many things concerning the last days, and that Nephi has been commanded to write no more of the things he saw in this vision. Finally, in Chapter 15, we learn that Nephi’s brothers aren’t able to understand the meaning of the things their father saw and spoke about in Chapters 8 and 10. Specifically, they ask Nephi about the olive-tree, and the scattering of the house of Israel. Nephi explains to his brothers that the house of Israel will be “broken off” from the olive-tree, and scattered upon the face of the earth; that the gospel will be restored among the Gentiles; and that when the house of Israel receives the gospel from the Gentiles, they will be “grafted in” to the olive-tree, and will come unto the true knowledge of their Lord and Redeemer. In Chapters 8-10, Lehi shares with his family his vision of the tree of life, and prophesies of the coming of Christ and the scattering of the house of Israel. Chapter 8 deals exclusively with the tree of life. In this chapter we learn that Lehi, Sariah, Sam and Nephi accept the gospel and are saved, and Laman and Lemuel reject it, which causes Lehi great sorrow. At the end of the chapter, Lehi pleads with Laman and Lemuel to hearken to his words, “that perhaps the Lord would be merciful unto them.” (1 Nephi 8:37.) Here we see Lehi’s love for all his children, and his desire that they should all be righteous. I believe we can also see this as a type of God’s love for his children – that no matter how rebellious and hard-hearted we may be, God always wants us to return to Him, and to know the joy that comes from following His gospel. In Chapter 9, Nephi interrupts his narrative to explain that he is keeping two sets of records: one for the ministry of his people, and the other for the history of their kings, and their wars and contentions. He explains that he has been commanded to do so for a wise purpose, but that he doesn’t know what that purpose is. In Chapter 10 Lehi prophesies that in 600 years, a Messiah will be born among the Jews, and he will be the Savior and the Redeemer of the world. Lehi prophesies that the Messiah will be baptized in Bethabara, that he will preach the gospel to the Jews, that he will be slain by them, and that after he is slain, he will rise from the dead and will reveal himself to the Gentiles. Lehi then speaks of the house of Israel, and compares it to an olive-tree whose branches will be broken off and scattered “upon all the face of the earth.” (1 Nephi 10:12.) He says that after the Gentiles have received the fulness of the gospel, the natural branches of the olive tree (meaning the house of Israel) would come to the knowledge of their Lord and Redeemer. Nephi then tells us that his father prophesied and spoke many more things, which Nephi does not record in his account. In verse 17, Nephi tells us that he was desirous “that I might see, and hear, and know of these things, by the power of the Holy Ghost, which is the gift of God unto all those who diligently seek him.” In Chapters 11-14, Nephi is granted this desire, and sees his own vision of the things his father saw. In 1 Nephi Chapter 8, we learn of Lehi’s vision of the tree of life. In it, Lehi beholds a man dressed in a white robe, who bids Lehi to follow him. As he does so, he finds himself in a dark and dreary waste for the space of many hours. He prays to the Lord to have mercy on him, and is shown a large and spacious field, and a tree whose fruit was desirable above all other fruit. As Lehi partakes of the fruit, his soul is filled with such joy that he is desirous to share this fruit with his family. At the head of a river, he sees his wife Sariah, and his sons, Sam and Nephi. He calls out to them, and they join him in partaking of the fruit. He sees his sons Laman and Lemuel standing at the head of the river, but they refuse to join their father. Lehi is then shown a rod of iron, and a straight and narrow path, which lead along the river to the tree where he is standing. A large group of people start down the path, but they are overcome by a mist of darkness and they lose their way. Another group comes forward and, holding fast to the iron rod, they reach the tree and partake of the fruit. However, as soon as they partake, they cast their eyes about as if they are ashamed of their actions. Lehi looks to see the cause of their shame, and he beholds a great and spacious building, in which the people are scoffing and pointing their fingers at those who were partaking of the fruit. A third group comes forward, and holds fast to the iron rod, and they reach the tree and they are not ashamed. The vision continues, and Lehi sees great multitudes of people feeling their way toward the great and spacious building, and many others who were drowned in the depths of the river, or who wandered off into strange paths and were lost from view. When I think about what this vision means to me, and how I can apply it in my life, the first thing that comes to my mind is how easy it is to see myself in each of these groups of people at different times in my life. As a young man, I didn’t think it was popular to be a member of the Church of Jesus Christ of Latter Day Saints. And so, I made choices that were not consistent with the gospel, and I associated solely with other young people who did not apply gospel principles in their lives. I guess I could go so far as to say that I was ashamed of my membership in the Church, and like those who partook of the fruit only to cast about their own eyes in shame, I was afraid of what people would think of me if they knew that I was a Mormon. Earlier in my youth, I occasionally found myself pointing at well known members of my ward, looking for fault in them in an attempt to justify finding fault with the Church itself. (I was, at times, a very critical young man.) There are even times in my life when I can identify my actions with those people who are seen in this vision “feeling their way toward the great and spacious building,” times when I thought that following the ways of the world would bring meaning to my life. When I first got serious about studying the scriptures, I often felt like those who had found the iron rod but were overcome by the mist of darkness – I always felt the spirit while I was reading the scriptures, but at other times I felt like I was slipping back into the darkness, and was sure to lose my way. Now I read from the Book of Mormon every day, and I often pray for the Lord’s guidance and inspiration as I study, that I can find the lessons or the principles that I need in my life. As I do, I find myself more and more desiring the fruit of the tree, a fruit which truly is desirable above all other fruit. It is only when I read from the scriptures every day, and resolve to do all that I can to “hold to the iron rod,” that I can look at myself in the mirror and without shame or embarrassment, tell myself that I am a member of the Church of Jesus Christ of Latter Day Saints, and that I know that God lives, that He loves His children, and that more than anything He wants us to return to Him. After traveling for what is believed to be 2 to 3 weeks, Lehi’s family sets up camp in the wilderness. We are introduced to Nephi’s mother, Sariah, and to his elder brothers, Laman, Lemuel, and Sam. Laman and Lemuel are described from the beginning as “murmuring against their father” and otherwise being rebellious in nature. It is established early on that they do not agree with their father’s decision to leave Jerusalem. In chapter 3, Nephi and his brothers are commanded to return to Jerusalem to obtain brass plates, which contain a record of the Jews and the genealogy of Lehi’s forefathers. They must secure these plates from Laban, a notorious military commander who seizes the family’s property and attempts to have the boys murdered. In the next chapter, the Spirit of the Lord guides Nephi to kill Laban, to wear his armor as a disguise, and thereby to convince Laban’s servant, Zoram, to bring him the brass plates and accompany him outside the walls of the city. Zoram joins Nephi and his brothers, and travels with them back to their father’s tent. In essence, Nephi tells us that he is not interested in sharing every detail of their lives, but that he is sharing enough details to show the hand of the Lord in all of their dealings, and to persuade men to come unto God. In chapter 7, the Lord commands Nephi and his brothers to return once again to Jerusalem, this time to convince Ishmael and his family to join them in the wilderness and to travel with them to the promised land. On their way to Lehi’s camp, Laman and Lemuel and two of Ishmael’s daughters and two of Ishmael’s sons rebel against Nephi, and attempt to take his life. Nephi prays for deliverance and is saved, and Laman and Lemuel beg him for forgiveness. Although the scriptures don’t give an exact timeline of these events, it seems safe to assume that Lehi and his family traveled for several weeks before setting up their camp. Also, their mission to obtain the brass plates would have taken at least 4 to 6 weeks, figuring 2 to 3 weeks each way, plus a minimum of several days in Jerusalem to obtain the plates. Their journey to bring Ishmael’s family down into the wilderness would also have taken at least 4 to 6 weeks, and it would likely have taken several weeks, if not months, for Lehi to read everything contained on the brass plates. I would not be surprised to discover that these seven chapters cover a period of time of at least four to six months, if not more.